"We’re excited to share, that we are now releasing the first developer version of our Opera 59 desktop browser with the new Crypto Wallet. This means, our browser now allows you to use the virtual currency stored in your Crypto Wallet directly with Web 3.0 websites in your desktop browser, without the need to install extensions. To get started, you will need to set up the Crypto Wallet in the Android version of the Opera browser, and pair it with this new version of the Opera desktop browser. The past two years have brought tremendous activity and new ideas around cryptocurrencies, tokens, decentralized apps, and how they all play a role in the vision for Web 3.0. More, and more developers are interested in building apps, that use cryptocurrencies, and want to use decentralized networks for some of their app’s functionality. Unfortunately, there are currently many challenges to reach wider adoption. These barriers range from users’ understanding of new terminology, to difficulties in acquiring cryptocurrency, and to complicated installation procedures. People are more likely to adopt new solutions if they are user-friendly, and seamless, and this is what we are aiming to solve. We are hoping, that by integrating Web 3 alongside the current web, will make the technology more mainstream. Once you pair your Opera desktop browser with your Opera for Android (beta), every time a website, or Dapp (decentralized app) requires you to sign a transaction or message, a prompt asking for a fingerprint confirmation will appear on your phone. No need to set up a different wallet for desktop. Your wallet’s private keys remain stored on the secure hardware of your mobile phone, and are never transmitted. Today marks another important milestone in our crypto project, which started earlier this summer, when the Opera for Android became the first major browser to introduce a built-in crypto wallet. The Wallet removed many of hurdles, preventing cryptocurrencies from being adopted by the mainstream, by enabling simple transactions on Web 3.0. The Wallet received an update in September to allow you to send crypto collectibles directly from your wallet to other crypto wallet users. 1) Run Opera developer on your computer. 2) Click the crypto wallet icon in the sidebar. 3) Click “Reveal the code” to show a QR code, that Opera for Android can scan. 4) In Opera for Android, click on the address bar, and then the QR icon top right, that allows you to scan QR codes. 5) Wait for the wallet to be connected. You’ll get a confirmation in Opera for Android, and on Opera for computers. 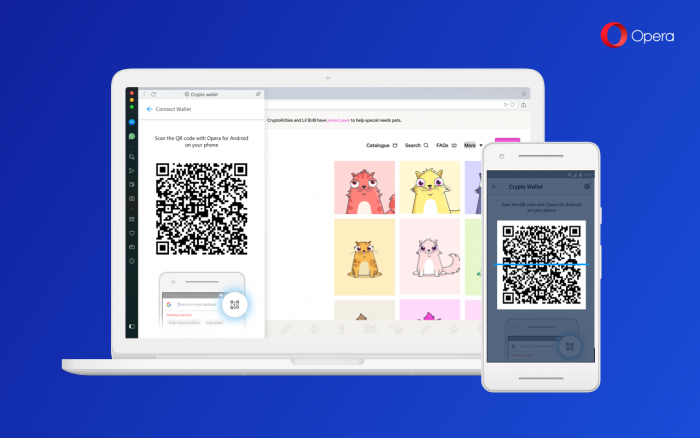 Now go to a site such as: https://www.airswap.io, or https://www.cryptokitties.co, to explore Web 3.0, and check out this new functionality. Don’t have the beta version of Opera for Android beta with Crypto Wallet yet? Or, go to Google Play store, and download Opera for Android beta. - Some fixes on ‘Search and copy popup’. - Fix for changing wallpaper from context menu. - Opera does not run on macOS 10.10." The Chromium has been updated to version 72.0.3591.1. - DNA-71703 Opera cannot see Remote devices. - Fixes for some crashes (details in the change log). - DNA-73659 Mouse gestures do not work on isolated content. - DNA-73966 Allow Yandex Zen users to choose Opera news. The Chromium has been updated to version 72.0.3610.2. - DNA-72330 Can't log out from Messenger on the sidebar. - DNA-74205 Page crashes on switching VPN state/changing VPN location. - DNA-73684 [Mac] Cmd+W closes window. "It was a very annoying bug, so let us know, if you’re still able to reproduce it. We’ve also added one of your requests to this build: “Desktop” title for desktop wallpaper is now visible in Easy Setup, and in the Settings page. There are also few fixes in Crypto Wallet." - [macOS Mojave] It’s now possible to minimize Opera, if it’s inactive application. - Easy Setup opens, when trying to change wallpaper with the context menu on the start page. - Tabs close with animation. - Some Crypto Wallet improvements. - Speed Dial folders are editable again. The Chromium has been updated to version 72.0.3622.0. - Improved SD suggestion-matching algorithm. - DNA-73057 Crash at extensions::SpeeddialPrivateEventRouter::OnBrowserSetLastActive(Browser*). - DNA-73700 [Mac] Crash at -[OCMockObject handleInvocation:]. - DNA-73753 Crash on exit at ui::EventHandler::~EventHandler(). - DNA-74415 Crash at ZombieObjectCrash: Zombie received window. - DNA-74481 Memory leak in Linux implementation of wallpaper::GetWallpaperPath(). - DNA-74497 Crash at chrome::GetBrowserContextRedirectedInIncognito(content::BrowserContext*). - DNA-74192 ‘Open all in new Tabs’ from context menu has wrong order. - DNA-74299 [Mac] VPN doesn’t auto-reconnect after WiFi interruption. - DNA-74347 [Mac] Clicking on notification doesn't switch to correct tab. - DNA-7466 Search-copy popup misplaced, after double click on selected text. Known issue: rate me is not working. The Chromium has been updated to version 72.0.3626.14. "Hi, and welcome in the first update we’ve prepared for you in 2019!" - DNA-73341 Crash at viz::FrameSinkManagerImpl::RegisterBeginFrameSource(viz::BeginFrameSource*, viz::FrameSinkId const&). - DNA-73381 [Linux] ‘Warn on closing multiple tabs’ dialog buttons are red. - DNA-74528 Crash at ui::EventHandler::~EventHandler(). - DNA-74588 Crash at extensions::ContentFilterPrivateEventRouter::~ContentFilterPrivateEventRouter(). - DNA [Mac] No focus on net installer. - DNA-74599 [Linux] No frame on pop-up windows. - [Mac] Shortcuts don’t work inside the Instant Search dialog. - [Windows] Minimise button is still highlighted after restore. - [Windows] Blank window after opening link when Opera is minimised. - DNA-71854 [Linux] browser crash at base::LazyInstance::Get(). - DNA-74381 [Mac] Blank pop-up displayed, when adding page to Bookmarks. - DNA-74678 [Mac] Crash when moving window to another display is fixed. Known issue: [Mac] Sidebar icons are red. "It’s time for our weekly developer update. It contains some crash-fixes and improvements. Known issue: due to DNA-74875 Sync is disabled in this build." The Chromium has been updated to version 72.0.3626.28. From now on, you can see notifications on the Opera shortcut in your taskbar (Windows), and dock (macOS) for unread messages in our supported communicators (Facebook Messenger, WhatsApp and Telegram). You can turn off notifications by using the setting “Enable notification badges for messengers” in Settings > Sidebar > Manage sidebar. - DNA-74238 [Win] Drag and drop of bookmark to tab strip opens new tab after the active one. - DNA-73276 [Win] Right click on a bookmark from BB opens new tab next to the active one. - DNA-74816 [Mac] Cmd+W closes private window. - DNA-74861 [Mac] Crash at views::View::SetBoundsRect(gfx::Rect const&). - DNA-74870 [Mac] Cannot move popup window by dragging the titlebar. - DNA-74876 Open external links in properly restored window. - DNA-74875 Sync is not working while settings page is open. - DNA-74908 Use after free on win, when continuing blocked navigation. - DNA-74926 [Linux] Window buttons (close, maximise, minimise) are not visible in Private mode. - DNA-74965 [Mac] Detached dev tools window is not draggable. Known issue: notifications in taskbar/dock appear also for downloads – this is reported in DNA-75003. The Chromium has been updated to version 72.0.3626.53.